At the end of October, we brought you a first look at a finely-crafted Air Jordan 13 Low done in collaboration with Edison Chen’s esteemed CLOT label. Done up in a traditional earthy color scheme meant to resemble the Terracotta Army – China’s first military with records dating back to nearly twenty centuries ago – it equips metallic gold embellishments, and chest armor-style panelling. 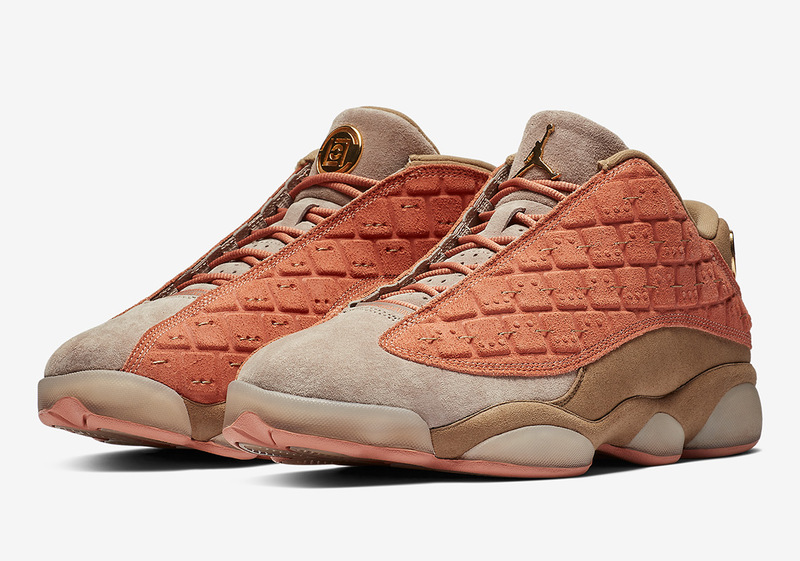 With its clay-colored midfoot coming connected by thin pieces of rope meant to further mimic more of the iconic warrior’s armor, CLOT and the Jordan Brand split branding responsibility on the tongues, and lateral heel stamps. Official images have surfaced, and a release is expected to go down sometime in January, delighting fans of this noteworthy collab done by the longtime Nike co-creators. Grab a detailed look below and tell us what you think of this honorary design created by Chen’s illustrious label. Update: The CLOT x Jordan 13 Low will exclusively release on December 8th at Innersect Shanghai, China and will be followed by a global drop at Juice stores on December 13th.